The debate around public art has to deal with the exceptional difficulty of being founded upon a ground that is anything but solid: that of public space. Once public space had been understood as a term, becoming potentially public, a representation of the function of democracy and hence subject to all its nuances, it remained constantly in question, much like democracy itself. And while the theoretical debate moves into increasingly intangible realms —to Bruce Robbins , public space will always be a spectre that was never there, existing only through its absence— in real life the quest for public space is stepped up as local authorities, companies and organisations try to capture its spectral presence and delineate it in the form of designs, programmes and redevelopments for better public spaces. The standardised, predictable results vindicate the laments of urban planners and human geographers who claim that public space as we knew it is finished  – if, indeed, it ever existed . The recognition of what is lost re-triggers the search for it, although it is not certain whether the spectre of public space can ever become tangible, even fleetingly; whether it can fit into the pattern of reality and have all its contents gain the designation ‘public’ – public art, public debate, public action. Reclaim the streets. Whether as a slogan of the activist movement of that name which claimed the streets for pedestrians or in its subsequent guise as the ‘occupy movement’ or, conversely, as the beacon in the programme of former New York mayor R. Giuliani  and his many subsequent imitators who pledged to remove the ‘undesirables’ from public space, the very same war cry about reclaiming public space permeates the rhetoric of both sides. At the back of all those quests for an ideal public space there is always this nostalgic, idealistic image of the traditional square, the ancient Greek Agora, the European square. It was on these, and for these, squares that the recent battles of democracy were fought. The greatest virtue of this ideal public space is its accessibility to all, since public space is activated by the crowds that fill it. It is precisely in the name of accessibility that the ‘public’ aspect is debased. On the part of the powers that manage it, a public space for all translates into a place that invites and actively attracts a crowd of people for whom it is not enough to just be there. “Good public space” means variety of uses, receptiveness, individuality and attractivenes, and this is where art undertakes to create the landmark, provide the reasons to go there, the measure of success being a sustained picture of lively crowds. Statistical surveys  in New York’s privately owned public spaces (POPS) show that this type of management results in large but too homogeneous crowds, which goes against the defining principle of the ‘public’ as an open, in-question field in which -and over which – the opposites can clash. Since both sides agree on the ultimately benign nature of public space as a conciliatory umbrella, as an ideal to be attained, “public space” ends up in the arsenal of those who wish to exploit it. Achieving this ideal means eliminating all possible subverters of social cohesion; but before resorting to stop-and-frisk practices to remove from public view any possible source of lawlessness (anyone who looks suspect is arrested), the tight control of public space can be left to design and art. Their imposing nature subtly and unconsciously dictates the appropriate safe behaviours, determines the way people move and leaves out those who feel foreign in this context. “Artwashing” helps defuse the public aspect, prompting a museum-like behaviour; the crowd turns into an audience, i.e. loses its status as co-creator of public space and becomes its consumer. The space is always filled with a content, it never is Lefort’s empty space where democracy can occur. A typical example is the almost self-negating competition “designing for free speech”  in New York in 2014 which, influenced by the whole revolutionary turmoil around squares, proposes public-space structures that promote free speech, i.e. designate ways and locations where one can be free: this disregards the fact that public space is a receptacle of free speech, anyway, and that speech is free to create its own space around it. “Planning is in clash with democracy”,  wrote F. Hayek in 1944, denouncing the totalitarian planning promoted by contemporary regimes (Communism, Nazism); what he could not predict was that their opposites, the improvised mechanisms of the free market, would lead sooner or later to equally fully-planned spaces and controlled behaviours. Hastily and naively read, however, this realisation could steer revolutionary imagination into seeking public space beyond the surrendered squares in the still-undesigned, shapeless expanses of a planet which is now fully subject to the urban condition. A vast area, inherently public, urban but not yet a city. Modernism was quick to recognise the potential of that vast terrain that spread before it. The vector of progress was seen as linear, cities were designed to grow ad infinitum with the ultimate prospect of fusing together, the buildings floated in free space and emptiness was abundant. Even utopias change, the enclosed, walled city giving way to the Archigram’s itinerant “walking city” and the expanding playful structures of the situationists. While apparently closer to a perception of space as the empty vessel of Democracy, the modern was hated and denounced as totalitarian. The space is empty but the ways, the behaviours are still predetermined. Modern space, as expressed by Le Corbusier in the Athens Charter, rejects the possibility of self-regulation, the democratic function, and sets the four functions of the Functional City: dwelling, work, recreation and transport. In a first critique in 1954, Despotopoulos proposes that recreation be changed to “social life”, correctly recognising the power of architecture to construct social space but not public space. Public space lies beyond the conflict between designed and non-designed. It needs something to render it visible, to give it shape — a public shape, albeit one that is not associated with accessibility, friendliness, density of uses and everything else that could otherwise ensure a “social space”. What has been shaping the public for centuries is the concentration of motions and actions around points, which becomes established over time to put together the emotional charge that will eventually be claimed. It is the very moment when public space emerges and becomes the point around (and about) which we can argue, and which we can even erase from the map. Erasure is not easy. 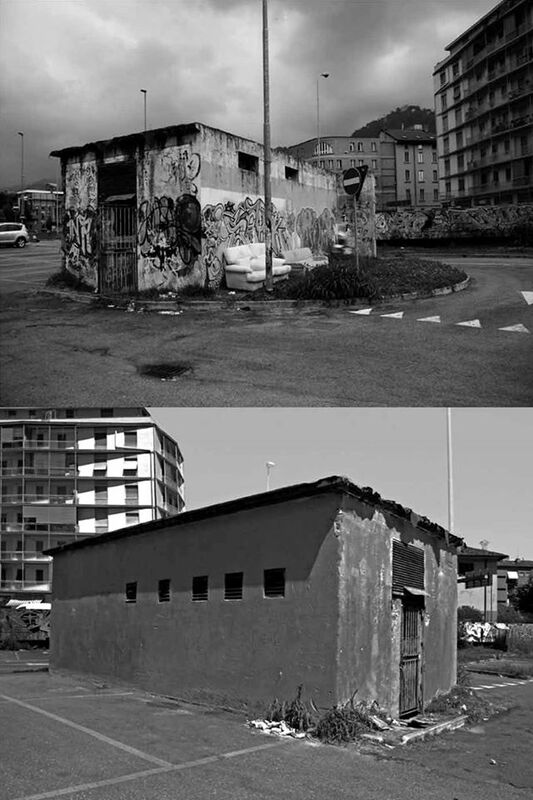 Entrenched habit is very powerful: it is what has produced the current symbolic and reclaimable public spaces; it is also what explains the occupy movements’ insistence to inscribe their presence in the space by remaining there, adding to an already excessive symbolic weight and refusing to give it away. Yet it seems that deletion is the only option in this conflict over lost public spaces; to de-characterise the space as public, to remove the flows and actions that make it public — to shift the public out. It is already happening on a much bigger scale with cities themselves: entire areas vanish from the map, are torn down, return to forest and reappear elsewhere. As in a wave the surface of the planet becomes a city and back again — and so does public space. In a controversial action in December, 2014, amidst much protest from the public, BLU erased one of their historical graffiti in Berlin, which had become a landmark in the context of a gentrification process, in order to protest against exactly that and give the signal for seeking the public somewhere else. What this process of shifting needs is a navigation code, something to designate the point where the space will come out of its in-vitro state and into the public sphere. And it is often art that reveals this possibility, setting the points on the map, rendering visible what was not, i.e. opening the debate. Art can momentarily turn the gaze and the motions to the urban ‘scraps’, to the not-yet-public. What follows is the usual cycle: the meanings pile up, and once they have solidified there comes a time when the question of public space is over and it’s time to pose a new one somewhere else. Is this a public space? If the answer is too emphatic, it is probably wrong. Public space is always to be reclaimed. Once reclaimed, it is already lost in its protective sphere. Friedrich Hayek, “The Road to Serfdom,” The Reader’s Digest, Vol. 46, No. 276, April 1945, 3. Categories: ARTICLES | Tags: occupy movement, public space | Permalink.